Description of "International Journal of Research August 2014 Part-2"
You will be intimated after the review of the article if in case it merits publication in our journal. In case an article fails to meet our standards, but is found to be of scholarly merit, the author will be notified of possible modifications that would make the paper/article print-worthy. 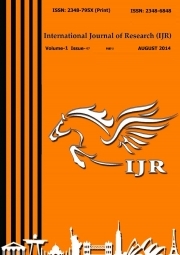 Reviews of "International Journal of Research August 2014 Part-2"